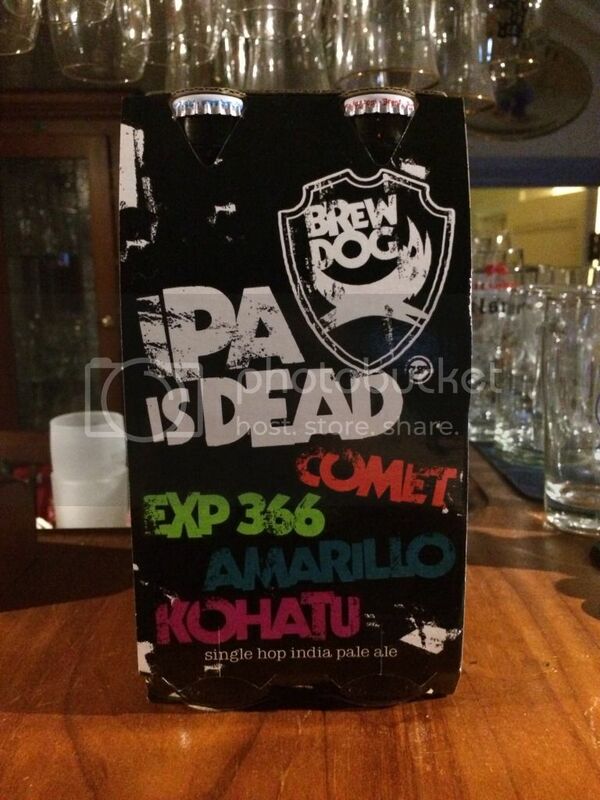 BrewDog's IPA is Dead is back again in 2014! This year we've got 4 hops again of which I'm only properly familiar with one, Amarillo. 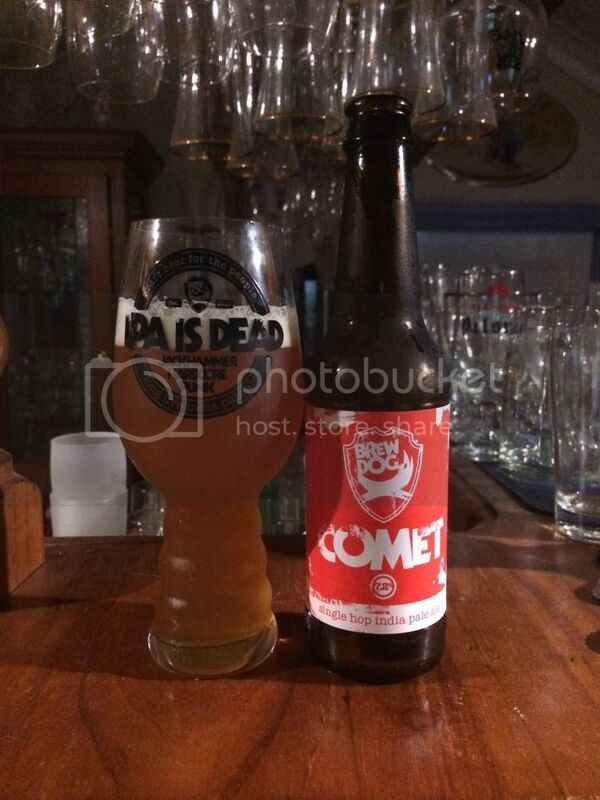 I've had Comet, but not sure if it's the same variety as the one in this beer. Anyway, I'm looking forward to trying all of them as usual. The base IPA recipe has been modified this year, with the ABV upped to 7.2% (from 6.7%) as a result. Hopefully this years beers allow the hops to show off their full characteristics, I thought last years were a little overpowered by a strong malt backbone. You can check out 2013 here and for good measure 2012 here. Once again I'm going to use this intro from the first IPA is Dead review that I wrote. "The experiment, as before, is simple: Four single hops start out with the same malts, the same ABV, the same IBUs, the same everything, except that each one is made with a different hop strain to showcase their individual character and talent." So I'm kicking things off today with Comet. It's quite hop variety, being used in the U.S. for about the last 40 years. It fell out of favour in the states and was largely forgotten about until this new German variety, where it's crossed with Hallertau, started being grown recently. So this single hop IPA promised strong bitterness and grapefruit flavours; thankfully it delivered on both! It's actually a really nice IPA. The other thing that I think needs to be mentioned now is that the change of malt billing should allow for easier detection of the hop characteristics than last year. It's quite light and inoffensive. 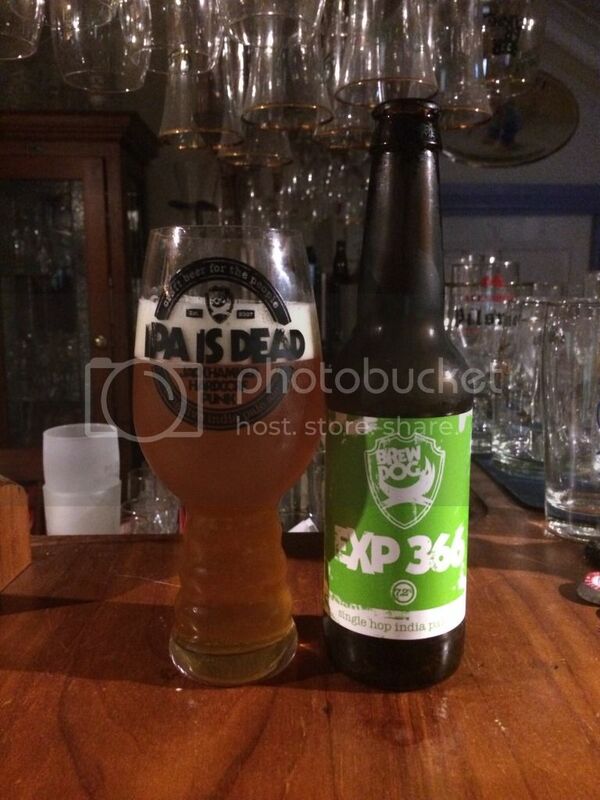 Beer #2 in the 2014 IPA is Dead pack is EXP 666. From my understanding this is an experimental hop variety bred off HBC, a hop in the 2012 IPA is Dead pack. Since this beer was brewed the hop has been given a new name, Equinox. I've been told to expect a distinctive pineapple flavour coming off this hop so I'm excited to give it a go! The flavour certainly is not typical. The hop has relatively little bitterness and the flavour and mouthfeel is unusual. I'm getting a resinous, chalky mouthfeel with pineapple, apricot and other fruit flavours to the fore. This is going to sound like a strange comment but the bitterness is sweet. You'd really need to try it to fully understand what I'm talking about. I think this would make a nice hop in a low ABV summer pale ale, good fruitiness. 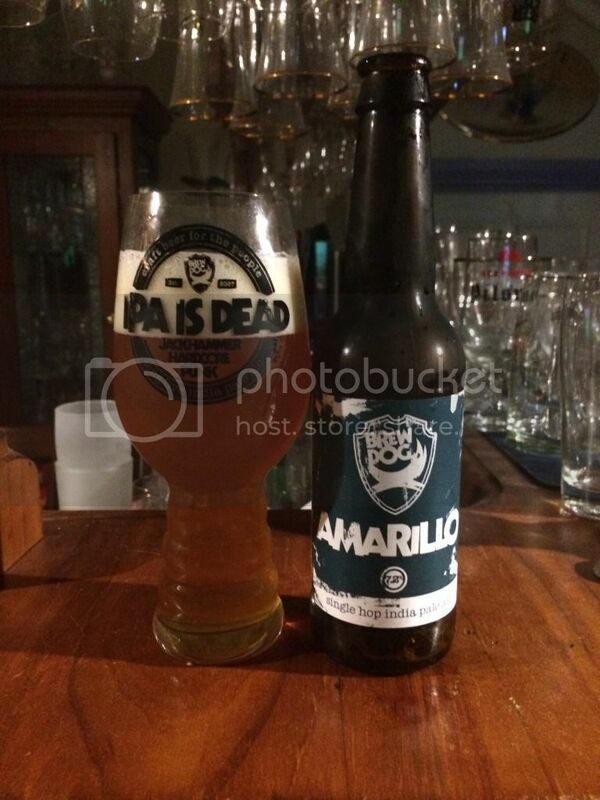 Amarillo is the third single hop IPA I'm having from this pack. It's the first hop I've had a really strong understanding of in this years edition. Normally it's predominantly an aroma hop but it imparts citrus and tropical fruit flavours as well, while not being particularly bitter. It's privately grown and is not available in rhizomes, which is pretty unusual. True lovers of hoppy beers know what Amarillo tastes like. 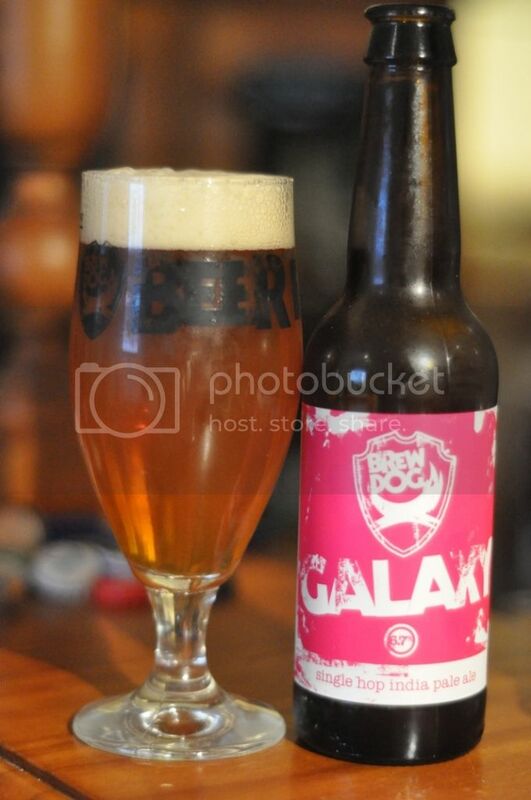 BrewDog have managed to capture this perfectly with this single hop IPA. There was plenty of citrus tang, as expected, and hints of floral hop notes. The floral elements came across much more strongly in the nose than the flavour. 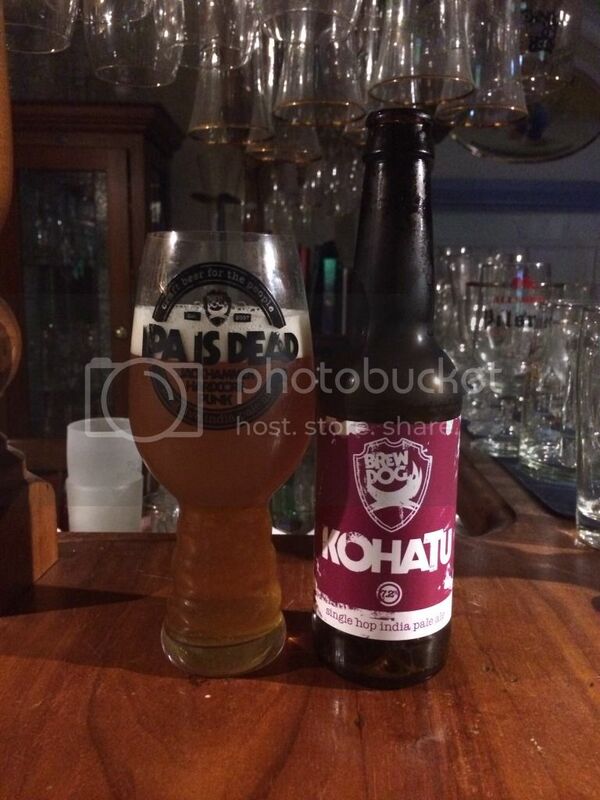 Kohatu is one of these New Zealand hops I'm sure I've had in a beer before, but wouldn't be sure when. It's a relatively new hop variety and like alot of citrussy New Zealand hops is lime driven rather than grapefruit. The roots of the hop are unknown/not well publicized but Kohatu is said to be from a European origin. The Kohatu has a really nice flavour with very little bitterness. There is plenty of tropical fruit flavours initially, before a distinctively lime citrus flavour comes through. I get sort of earthy undertones on this one as well. This is, in my mind, the weakest of the 4 - there's just not enough bitterness or flavour to overcome this lack of bitterness. So there we go, BrewDog's IPA is Dead is done for another year. Once again this years pack has been an education. In terms of which beer was best I'd have to say the Amarillo, with a special mention to the EXP 366 which was a truly unique beer. The hop is really quite unusual and one I think that could lend itself to a number of styles. If you take these packs for what they are and don't expect them to all be world class beers you won't be disappointed; they really do showcase the hops well!